So you want to buy a sat nav. There’s a lot to consider – budget and brand, for starters – and that’s before you even get to features and functions. Once you get that far you’ll almost certainly end up lost in a sea of anagrams and nonsense. What does it all mean? Well don’t panic, we’re on hand to help out with a handy sat-nav jargon buster. Advanced Lane Guidance – This is a TomTom system that displays the layout of the road ahead on multi-carriageway roads with signage. This lets you move over to the correct lane for your exit in good time. Garmin’s equivalent is called Lane Assistance. Aspect ratio – Like with a television, sat navs are available in widescreen, or 16:9 aspect ratio. These are usually more expensive but offer clearer, larger displays than standard 4:3 ratio navigation systems. Bluetooth – Bluetooth allows you to wirelessly connect devices together. With sat navs this typically allows users to connect phones, enabling advanced features like internet searching or handsfree calling. Capacitive touchscreen – Capacitative touchscreen displays are more modern than the alternative resistive type. They respond to gentle finger presses and finger gestures, plus they are much more responsive, but can’t be used when wearing gloves. Dual Orientation – A dual orientation navigations system can be used in either portrait or landscape mode. The system typically detects which way up it is and changes the display accordingly. Easyport – A TomTom system consisting of a suction mount with a quick release, allowing you to easily remove and refit the sat nav in the same position. ETA – Estimated Time of Arrival. Most navigation systems can be configured to show the ETA or a countdown of time remaining on the current journey. European mapping – Pre-programmed maps for mainland Europe. Increasingly common as standard on modern sat nav systems. GPS – Global Positioning System. Satellite-based navigation system used to determine location. Navigation systems lock onto GPS satellites to determine where your car is and to gauge its speed. Integrated - The name given by car manufacturers to their built-in navigation systems. Convenient but usually expensive to upgrade and repair. IQ routes – A TomTom utility built into many current TomTom navigation systems. It bases its routing on the average speed recorded by other drivers, so will attempt to avoid slow and congested routes. Lane Assistance - Garmin equivalent of Advanced Lane Guidance. Shows on screen the correct lane for upcoming roundabouts or motorway exits. Mounting Disc – A small, cheap disc of plastic that sticks to a windscreen or dashboard permanently, offering a smooth, flat surface to use with suction mounts for extra stability. Resistive display – Older and cheaper navigation units use this type of screen, which use two layers to determine where pressure is being applied. Less responsive than modern capacitative screens, but can be used with a stylus or when wearing gloves. Screen size – Cheaper navigation systems use smaller screens, typically of around 4.3 inches. Larger sat nav screens are usually much clearer and easier to read, with pricier systems using screens up to 7 inches. Traffic – Most sat navs have a receiver to pick up traffic alerts, which will then appear on screen. The nav may then adjust your estimated arrival time or find an alternative route. More expensive sat navs connect via the internet to get more detailed and up to date traffic information even on smaller roads. 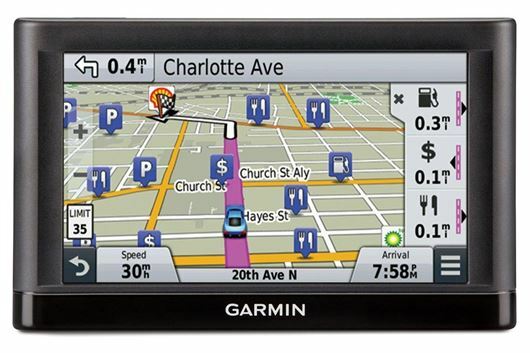 Up Ahead – A Garmin system that shows useful points of interest in the local area and on-route. These include hospitals or filling stations.